READY MEALS: Occasionally, I feature a one of my own recipes on my Blog, but I confess not to be the greatest cooker and therefore, I do rely on Supermarkets and Retailers to provide me with the basics for dinners. Therefore, it seemed both interesting to find new products (entered into the Ready Meal class) as well as contribute my taste buds to this category for the first time. Surprising the number of dishes that we had to try as part of this category. Most had to be heated up with supporting people organising the continual supply of hot dishes for our review and judgement. It varied from fish fingers to cook-in-the-bag pasties, chicken & bacon Pasta heated in the oven to curry meals heated in the microwave. The instructions from manufacturers were followed so that each product was at the optimal temperature and recommended cooking method. Several sausages were entered into the Ready Meal category which suggests that this may become it’s own class at some point. A great variety was enjoyed including a very sweet sausage which included pork belly and maple syrup to add sweetness to the pork filling as well as a rather unusual Coronation Chicken sausage. This had the kick of curry alongside the clean taste of chicken which I found to be both different as well as rather lush. This wasn’t universally felt and we had some debate around sausages when it came to awards. And one of the sausages was made with Ostrich meat: it tasted like chicken! These Fish Fingers had a good crunchy topping as well as soft delicious fish filling. A ready made pasty which cooked in a bag in the oven. The pastry was well filled and the pastry tasted fresh. This Beef Casserole came complete with Dumplings which was a real unusual treat. It was light and airy and had a good seasoned sauce. Several Ready Meal Chicken Tikka Meals with separate rice, thick sauce and well-flavoured chicken. One of the many sausages we enjoyed. A great selection of Meaty & Fishy Ready Meals for 2017. TEATIME: Another new category for me to judge was “TeaTime” which I imagined would include cakes (rather than desserts and puddings) and some sweet (and possibly savoury) biscuits. Now these are a stable part of my diet so I felt I could contribute to this Class of the competition. After having a morning of eating Ready Meals (as above), it was quite exhausting to have so many cakes to sample. The cakes varied from whole cerlebration cakes which were quite expensive as a whole but very large and would feed a party /dinner party to smaller packs of individual cakes such as muffins, some with rich zesty fillings (such as Lemon Curd or Triple Chocolate with pieces of Chocolate as well as a runny Chocolate Ganache). We also tried a few Tray Bakes which were rather tasty and I rather enjoyed my first taste of Treacle Tart: a cake I’d never had before but will definitely be trying again! Lovely sweet and sticky Treacle Tart with a hint of citrus. Banana and Chocolate Loaf with a soft light sponge and real banana on top. Good solid slices of a Victoria Sponge with a great buttercream and jam filling. A great Gin and Tonic cake which had to be tried several times to validate the taste of the cake. A dark Chocolate Rum cake with a strong smell and flavour. A healthy seedy biscuit with lots of goodness and healthy bits. And at the Awards Ceremony, in celebration of 10 years of the FreeFrom Food Awards, a new publication will be released to mark the occasion and share the history of the awards. I am sure this will also provide some useful insights into how the winners are decided and the story of some of the winners which are truly inspirational. 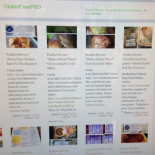 This entry was posted on February 9, 2017 by glutenfreepsd in News & Views, Product Review: and tagged food allergies, Food Matters, Free From Food Awards, FreeFrom, Gluten Free cakes, Gluten Free Ready Meals, Gluten Free Sausages, gluten-free biscuits, shortlist, Tea Time.